2017 Sea Hunt Edge 24 One of our first 24 Edge's of 2017! These are best sellers and move fast. 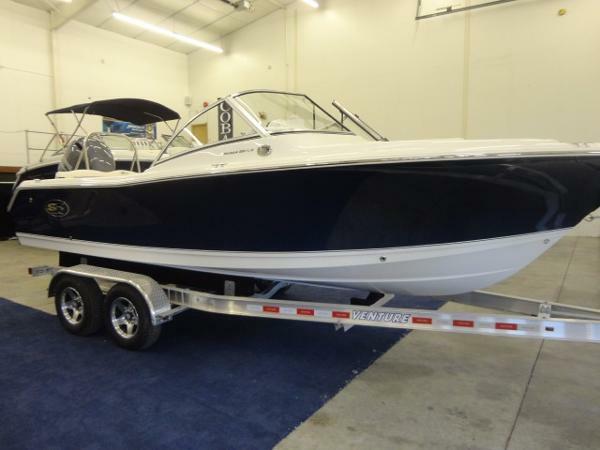 Call to set up an appointment to see this gorgeous boat, two available! 419684535 With every accommodation a family could desire in a boat, the Edge is the most versatile boat in our fleet. Including everything from a bow picnic table, built in trash can, bow back rest, China Toilet with holding tank, and oversized T-Top w/ Misting System, to rod holders and rod storage - we literally thought of it all! The abundance of rod holders and a livewell instantly turns the Edge into a pleasure fishing boat. 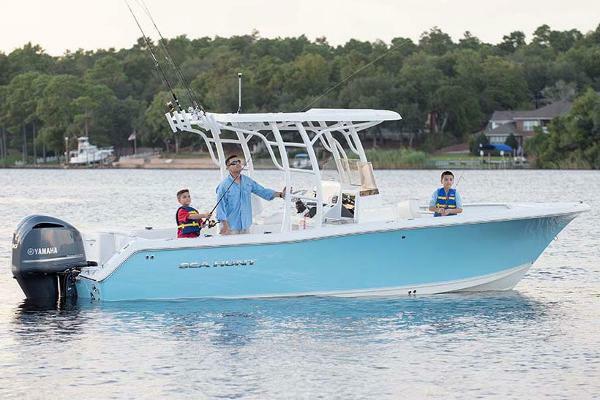 This 24 Edge comes equipped with the following: Yamaha 300, Ice Blue Hull, T-top underside in Ice Blue, Mezzanine Seat, Hardtop, Powder Coating, Power hydraulic tilt steering, and a stainless prop! Call 4196845365 for more info or shoot us an email. Dont forget to tollow us on social media @ Clemonsboat1. This new center console is for sale in Sandusky, Ohio. 2016 Sea Hunt Gamefish 27CB PRICE SHOW IS MSRP AS EQUIPPED, CALL FOR SALE PRICE! The Sea Hunt line is still the most popular selling center console on the planet! We have a very limited supply of inventory, so if you are in the market, we urge you to come see us quickly! This boat will be here to see February 8th, but will likely be pre sold. 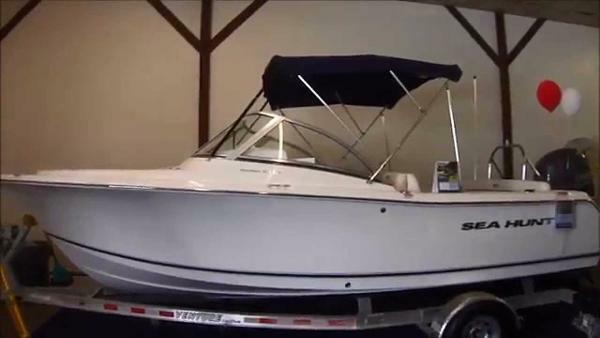 It is equipped as follows: Twin Yamaha 200 4-strokes, White hull, rear bench, power steering, bow backrests, hardtop with misters, side entry ladder, and tons of standard features! Please give us a call at 419-684-5365 for more information or shoot us an email! Don't forget to check us out of Facebook and Twitter @ Clemonsboats1! 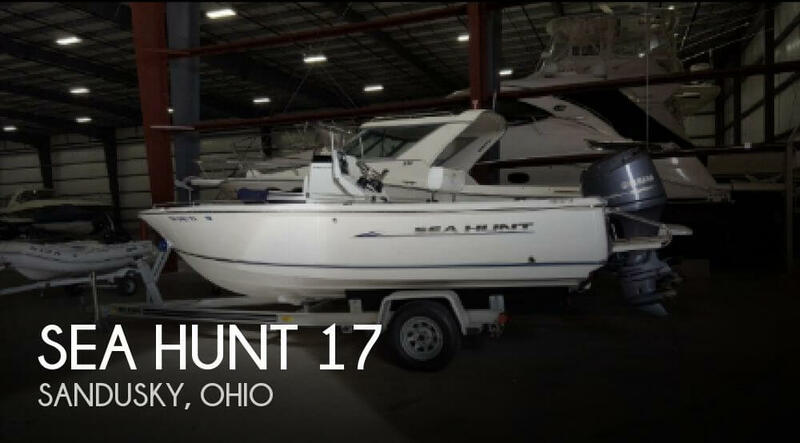 This new Sea Hunt 27CB Gamefish is for sale in Sandusky, Ohio. 2016 Sea Hunt Gamefish 25 PRICE SHOW IS MSRP AS EQUIPPED, CALL FOR SALE PRICE! 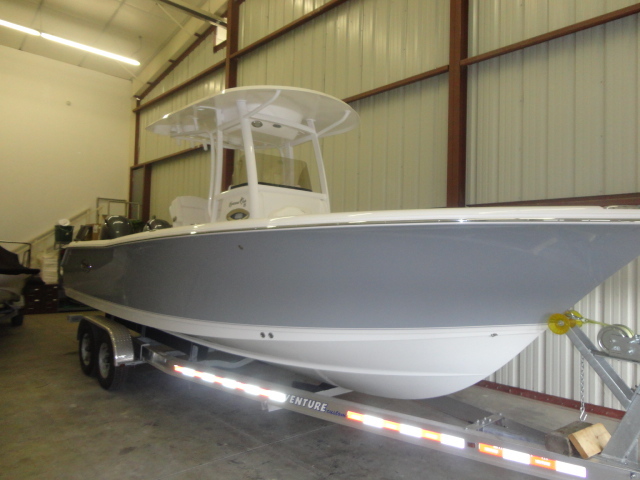 The highest selling 25 foot center console made today, the Sea Hunt 25 Gamefish! This boat rides great, and is super economical with a cruise speed of around 30mph only burning 10GPH of fuel! That is with twin 150's! If you want to see what VALUE is all about, come check this boat out for yourself. We have a sold one here to show and this boat will be here early February. These sell fast, so get you name on it soon as it will likely be pre sold before delivery to Clemons Boats. This 25 Gamefish comes with the following equipment: Twin Yamaha 150hp 4-strokes, titanium grey hull, hard top with misters, power assist -steering, rear -bench, bow backrests, side entry ladder,and tons of standard features! Call 419-684-5365 for more information or shoot us an email. Don't forget to check us out on Facebook and Twitter @ Clemonsboats1! 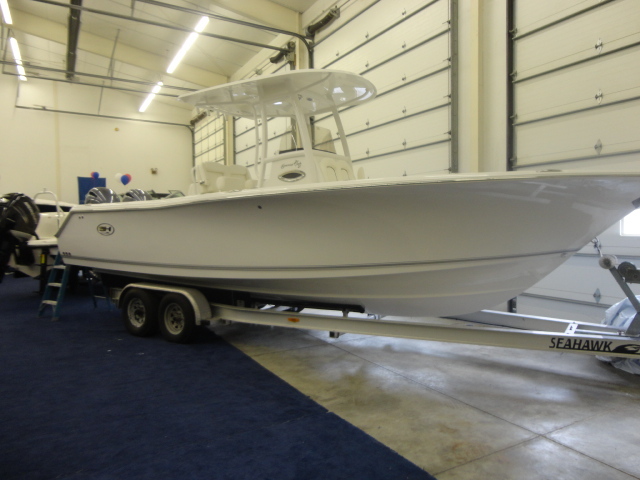 This new Sea Hunt 25 Gamefish Center Console is for sale in Sandusky, ohio. 2016 Sea Hunt Escape 235 SE PRICE SHOWN IS MSRP. PLEASE CALL FOR SALE PRICE!! Boat is on order with the following options: Yamaha 20XB 4-stroke, Tilt Sea Star Hydraulic Steering, Deluxe Helm Chair, Passenger Lounge, Daul Battery Switch, Bimini Top, Trim Tabs, Porta Potti, Ski Tow Bar, Side Entry Ladder, Tan Interior, and Carolina Blue Hull. Our Dual-Console Escapes are "All-Around" boats; capable of catching fish, pulling wakeboarders, and taking your family and friends for a sunset cruise. With cushioned lounge, bow & bench seating; large console storage with room for a porta potty; floor storage, and built-in cooler space; Our Escapes make for first-class, all-around family rides. For more information, give us a call at 419-684-5365 or shoot us an email! Don't forget to Like us on Facebook and Follow us on Twitter @Clemonsboats1 . 2016 Sea Hunt Edge 24, Boat just arrived, more pictures and video to come shortly. 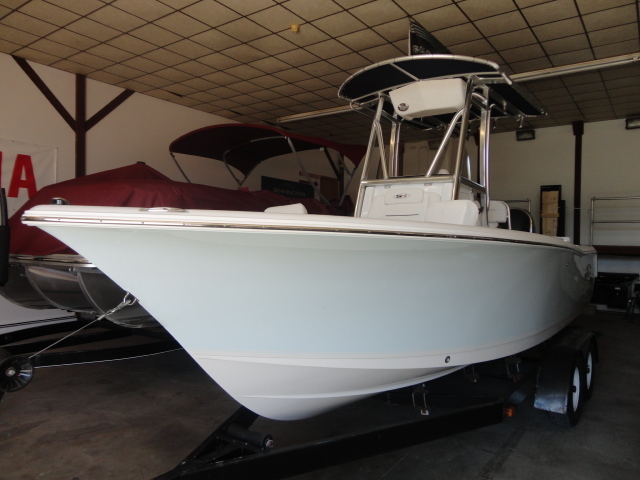 If you are in the market for a very unique center console, you need to come check out this Sea Hunt 24 Edge! This is the perfect combination of a center console and a dual console. It is designed on a center console platform, but has a very large top and console which provide lots of shade and protection from the elements. On top of that, it has a ton of seating space! 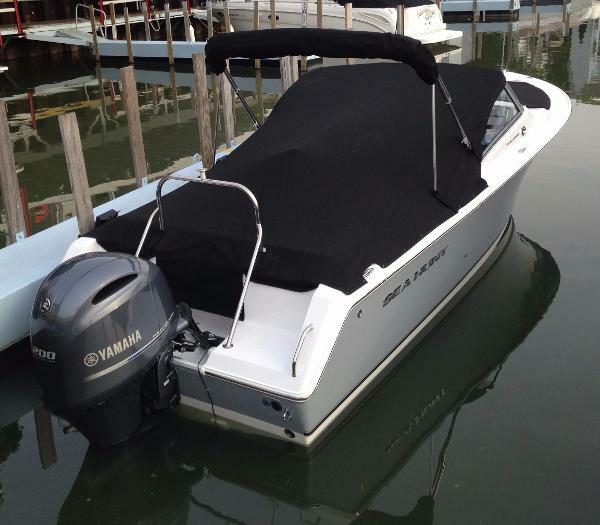 This particular Edge comes with the following: Yamaha F300 4-stroke for power, tilt steering, mezzanine seat, bow backrests, powder coating, and the black hull. The 24 Edge comes with tons of standard features and is pretty loaded from the factory. Stop by and check this boat out while it lasts! Call 419-684-5365 for more information on this boat or shoot us an email. Don't forget to "like" us on Facebok and follow us on Twitter @ Clemonsboats1! 2016 Sea Hunt Ultra 225, New arrival! We will have more pictures and video to come shortly!This Sea Hunt 225 Ultra isn't the best selling fishing boat on the planet for nothing! 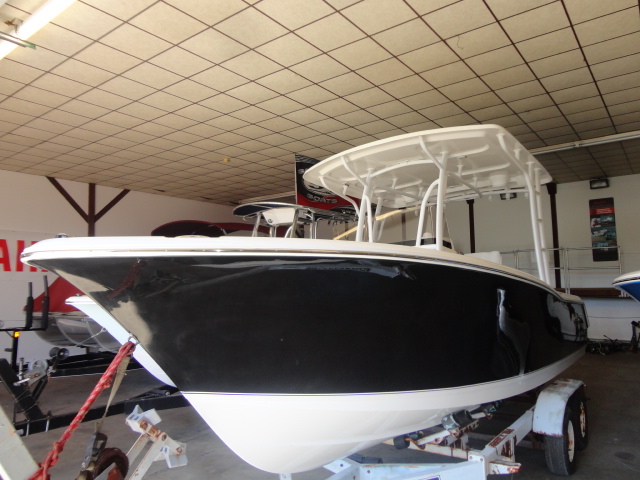 Stop by and let us show you what makes this boat so popular with fisherman and pleasure boaters alike! This Sea Hunt 225 Ultra comes equipped as follows: Yamaha 200XB 4-stroke, Ice Blue hull, tilt steering, leaning post with backrest, bow backrests,porta-potti, dual battery switch, deluxe t-top, trim tabs, ski tow bar, console cover, and lots of standard features! Call 419-684-5365 for more information or shoot us an email! Don't forget to "like" us on Facebook and follow us on Twitter @ Clemonsboats1!